Benjamin’s Carpet One carries a great selection of window treatments from Hunter Douglas. Hunter Douglas combines function and design to create window treatments that can block light and noise while still emphasizing style. 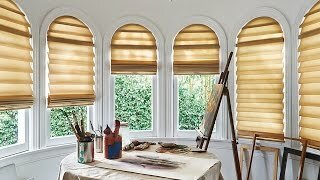 Hunter Douglas is certainly one of the most innovative brands when it comes to window treatments. It, for example, utilizes new technologies to make its window treatments easy to use. 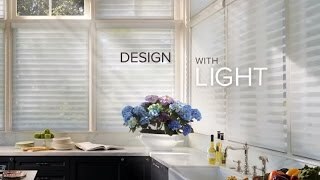 Also, Hunter Douglas focuses on energy efficiency and child safety by offering motorized systems. Some of these systems can even open and close the window treatments automatically! You can rest easy knowing that your new Hunter Douglas window treatments will certainly make your life easier and more beautiful. Hunter Douglas offers high-quality blinds and shades, both of which are time-tested options for your homes. 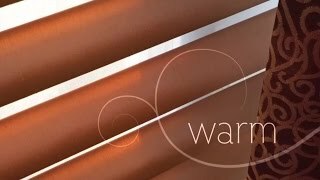 Blinds: Hunter Douglas has wood blinds, faux wood blinds, and metal blinds. Its wood blinds are part of the Parkland Collection, and they feature strong wood constructions. Parkland blinds are handcrafted for premium style. The EverWood Collection consists of faux wood blinds, which, although they look like real wood, are made from composite materials. Faux wood blinds are more durable than wood blinds. Hunter Douglas also has metal blinds that are easy to clean and maintain. Shades: Shades are popular because, unlike blinds, they can totally block sunlight and maintain privacy. Hunter Douglas honeycomb shades do just that, and they have a honeycomb-like construction that actually helps maintain indoor air temperatures. In addition, Hunter Douglas has Roman Shades. 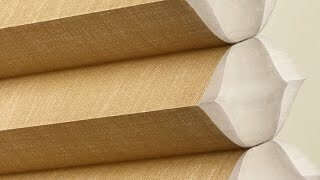 Visit our special Hunter Douglas page to learn more. Duette honeycomb shades are stylish and functional. They can actually help maintain indoor temperatures and lower heating costs. Luminette privacy sheers are similar to drapes, and they are perfect for large windows and sliding doors. We love Pirouette shadings because they feature a soft construction that can still regulate sunlight and increase privacy. 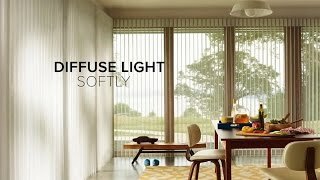 Silhouette shadings are perfect if you need to regulate sunlight in a room. Plus, they are super-stylish! Vignette Roman Shades do not have any slats, so they totally block sunlight and keep windows looking uncluttered.